Chongqing ‘nightlights’ are touted as one of the city’s best attractions and on a clear night this view can be appreciated from many vantage points. One unique way to savour the sights is from the deck of a river boat. 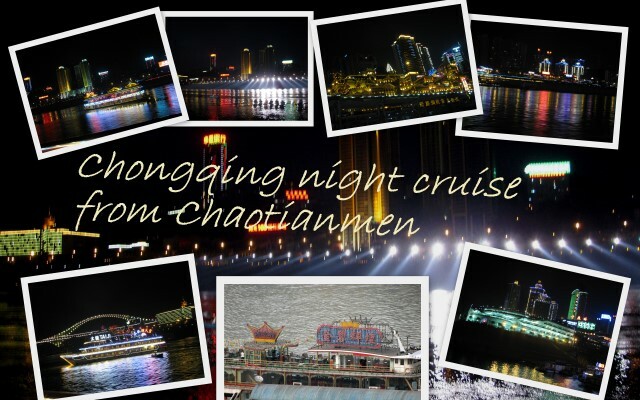 Every evening, rain, hail or shine a variety of cruise craft both large and small ruffle the reflections of the city as they battle the currents of the two mighty rivers that have set Chongqing apart. It was with mixed feelings that I agreed to join a small party of friends for dinner one evening followed by the evening cruise. On a previous cruise the night was cold and damp and meal was less than average. It was not something I was prepared to recommend but I happy to say that this recent cruise was a good experience. After dinner our group made our way to Chaotianmen and Dock 5 where our boat was moored. Since it was an unusually warm and balmy evening for early March with clear skies and a slight breeze we joined many other passengers on the outside upper deck of the 金 碧 辉 煌 Jinbihuihuang ‘Splendid and Magnificent’. And while we were the only group of foreigners on board many of our fellow passengers were visiting from places in Sichuan and Hunan Provinces. The boat departs promptly at 8.00pm slipping momentarily downstream on the current of the Yangtze before making its way up the Jialing River past Hongyadong dressed in her soft gold fairy lights, brilliantly lit floating restaurants, Yangtze River cruise ships and the new Entertainment Centre under construction on the north bank in Jiangbei Cheng. At the HuangHuaYuan Bridge the boat turned downstream again returning to the dock around 9.00pm and stopping just long enough to pick up another batch of passengers before finally cruising a short distance up the Yangze River towards the Yangtze River Bridge with views of Nanbin Lu and Jiefangbei. It truly is a splendid and magnificent sight on a fine and warm spring evening. # Tip: To avoid disappointment choose a fine, clear night and buy your ticket on the dock. Tickets may be purchased in advance but there is no guarantee what the weather will be doing. # Recommendation: While there are several evening cruise boats to choose from, I highly recommend this one because the dock is easy to locate and access, the boat is fast and clean with good quality service. Light refreshments and drinks can be purchased on board. # Directions: Arrive at Chaotianmen Plaza and walk out until you are overlooking the junction of the rivers. The boat has a large Red Crown in neon lights and another in red and blue金 碧 辉 煌 Jin bi hui huang ‘Splendid and Magnificent’ blazing above the upper deck so is impossible to miss. Take the stairs down and out through the Chaotianmen Gate and continue down the steps to the waters edge on Dock 5. 码头5号Arrive a little early if you still need to buy your tickets. There is a man selling tickets on the pontoon and you will not be able to proceed until you have purchased tickets.